Made this Rose Petal cake for a bridal shower, I used 3 8” layer to reach my desired height. When leveled I believe the bottom tier measured a bit over 5 1/2“s. The top layer was a full 3” high 6” cake. Covered all cakes using butter-cream. The petals were made with a round cutter using tinted using teal colored fondant. With a round ball tool and a cellulose pad I thinned out the edges for the ruffles. Each ruffle was then attached using additional butter-cream as the glue. The top tier of ruffles I added gum paste to stiffen them so they would not fall flat over the edge. The pearls were also made with gum paste as fondant would be too stretchy. I then dusted the pearls with petal dust to give them more of a shiny look. 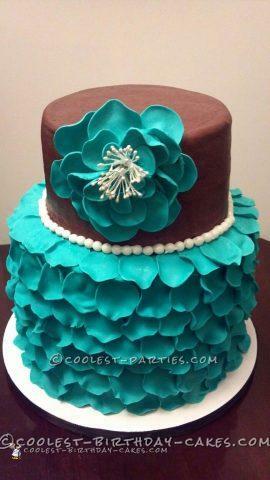 The flower was constructed on the cake using petals made of fondant and gum paste to dry quickly and stand on their own. Again each petal was attached using butter-cream. First I attached the stamens using a wire and inserted that wire into a coffee straw and then built the flower. As you can see the top tier was chocolate, the bottom was a white cake with raspberry filling – quite yummy. The colors chosen were the colors of the bridal party. Over all I was pleased with the way it turned out for my first rose petal cake and first time making pearls. Next time I will spend a bit more time on the pearls but I was so tired by the time I finished the petals I was about “over it”. The girls thought it was lovely and the bride to be was over the moon with her girly girl cake.